Rowing Machines have become immensely popular with the growing trend of HIIT (High Intensity Interval Training) and Crossfit. Rowers typically take up a small amount of space, are foldable, and store and move easily. Rowers can use air, hydraulic, magnetic, or water resistance. Air resistance rowers have a fan-looking section at the end where the foot rests are located. Pulling on the handle causes the blades of the fan to spin, providing resistance against the air. Water rowers work in a similar fashion, but have an enclosed water tank at the end and use a spinning mechanism in the water to provide the resistance for the user to pull against. 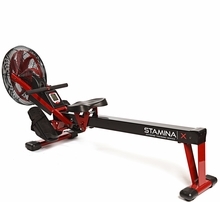 Hydraulic resistance rowers can have one central arm or dual arms. The dual-armed machines better-mimic an actual rowing motion with proper arm positioning. One or two hydraulic cylinders connected to the arms provide the resistance for these types of rowers. Finally, magnetic resistance rowers provide resistance using the same mechanism found on magnetic-resistance exercise bikes. Magnetic resistance machines are typically more expensive and many feature computers with LCD screens that display various workout metrics. Aerobic Exercise Bikes, also called stationary bikes, can be found in upright and recumbent styles with various modes of resistance. Upright bikes position the rider as they would sit on an actual bike if they were riding on a trail, sidewalk, or street. Recumbent bikes feature a seat with a back, generally on a rail for adjustable positioning. This design takes stress off of the user's back and upper body and allows them to focus the workout on their lower extremities. 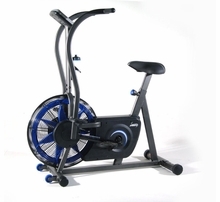 Exercise bikes use air, magnetic, or tension resistance mechanisms. Air resistance bikes use a fan-like wheel powered by the rider's pedaling motion to provide resistance. Tension resistance bikes have a flywheel on the front and an adjustable tension mechanism that provides varying levels of resistance on the flywheel. Magnetic resistance bikes are the most common and allow for the greatest amount of variation and customization based on the rider. 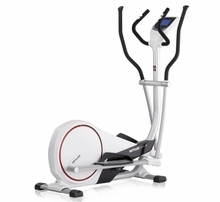 Elliptical machines provide a great, low impact aerobic exercise option. 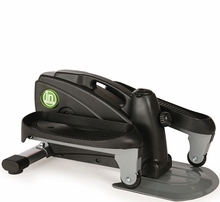 The traditional elliptical machine positions the user in a standing position, holding on to handles that move in conjunction with the foot pedals. Magnetic resistance is the main style seen in these machines. Compact elliptical striders can be easily moved and placed under a desk, in front of a couch, or anywhere else you may be seated for a while and do not want to remain stagnant. These machines typically use a tension form of resistance. 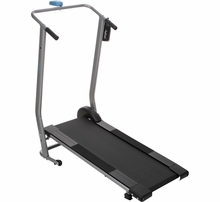 Treadmills come in a huge range of shapes and sizes. Most treadmills are powered by an electrical motor, but there are a few manually-powered options. The features, capabilities, and safety devices are different on each style. Make sure you take the time to properly research before purchasing.